Careington discount dental. Starting at $6.95/mo. Immediate coverage for families or individuals. Call us at 1-800-515-7401 for assistance or over the phone sign up. 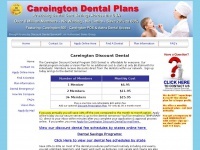 The web server used by Careingtondiscountdental.net is located in Lansing, USA and is run by yours4free.net. On this web server 21 other websites are hosted. The language of those websites is mostly english. A Apache server hosts the websites of Careingtondiscountdental.net. HTML 4.01 Transitional is used as markup language on the webpages. To analyze the visitors, the websites uses the analysis software Google Analytics. The website does not specify details about the inclusion of its content in search engines. For this reason the content will be included by search engines.